In “Enlightenment Now,” a presentation packed with graphs showing data from the Middle Ages to the present day, Harvard psychology professor Steven Pinker persuasively argued that the world is doing better than ever before by every important measure: decreases in disease, poverty, pollution, inequality, infant mortality, war and wartime fatalities, authoritarianism; and increases in health, happiness, life expectancy, and democracy. Pinker’s point is not that we should be complacent. 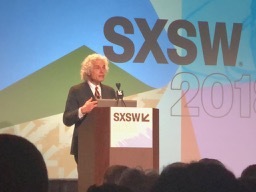 Rather, Pinker urged the audience to recognize the immense progress that has been made through humanity’s use of reason and science, to appreciate what centuries of effort have produced, and what humanity must continue to strive for. Watch Pinker make the same argument at Davos. In “Mayors Disrupting Locally, Leading Globally,” Mayors Bill De Blasio of New York, Ted Wheeler of Portland, and Steve Adler of Austin discussed how an alliance of mayors is leading in the absence of federal government action or regulation – for example, on the issue of net neutrality. Mayors from around the country have not only condemned the FCC’s recent move to rescind its net neutrality rules, but as Mayor De Blasio announced at this session, have created the Cities Open Internet Pledge, which commits cities to use their substantial economic leverage to not contract with internet service providers that fail to honor net neutrality principles. (Seventeen mayors and city leaders have since joined the pledge, the text of which can be found here.) It was a lively session, in which these mayors expressed strong opposition to current federal policies. You can hear the audio of this session here. I ended the day at the Cities Summit Opening Party at the European Union’s pavilion. (Many countries, states and cities set up their own event areas at SXSW.) One great thing about SXSW is that you meet some very interesting people. At this event, I met an entrepreneur from San Francisco who was working with a partner on “growing” meat. Yes, you can take a piece of meat, culture it in a lab, and grow more. The idea is to eventually address both the ethical issue of animal cruelty and the significant environmental footprint of cattle ranching and meat production – though as this Washington Post article reports, there are many challenges to overcome before this is commercially viable (unless you want to pay $330,000 for your hamburger). Update (May 4, 2018) – Tyson Foods, the nation’s largest meatpacker, is co-leading a $2.2 million investment round in an Israeli startup that is producing meat from animal cells.